Share our fundraiser with your friends & family on any social media platform & receive an extra entry to our prize draw! 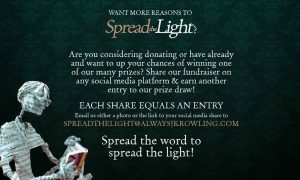 After a very successful fundraiser for Lumos last February, Spread The Light is back for our second season, celebrating J.K. Rowling and Harry Potter’s birthdays, plus the launch of “Harry Potter and the Cursed Child”! Is there any better way to wish them a happy birthday than donating to The Anne Rowling Clinic? “Established with a donation of £10 million by J.K. Rowling, the Clinic carries the name of her mother, who died aged 45 without knowing her daughter was writing the most successful book series in history. They work to find treatments that will slow the progression of multiple sclerosis and other neurological diseases, all progressive and incurable as of yet, with the ultimate aim of repairing damage to patients’ systems”, explains Pedro Martins, one of our founders and webmaster of Potterish, in a special article for the British The Guardian. “For those who do not know about multiple sclerosis, the exact cause of that disease is unknown, but something triggers the immune system to attack the brain and the spinal cord, which make up the central nervous system, causing an interruption of communication. The patients are generally young people, especially woman from 20 to 40 years old. They suffer from unpredictable symptoms, such as numbness, tingling, mood changes, memory problems, pain, fatigue, blindness, paralysis and more”, continues him. When you donate, you will be automatically entered to win one of our incredible prizes, from “Harry Potter” cast/crew autographs, signed books, a personalized letter from a “Fantastic Beasts” star to so much more. Please read the FAQ & Terms and Conditions. Thank you for your generosity and Felix Felicis!